Michigan State University (MSU) released a new study this week that clears biofuels from Indirect Land Use Change (ILUC) charges. This new reports sets the record straight from previous reports that maligned biofuels by using incomplete and faulty data. 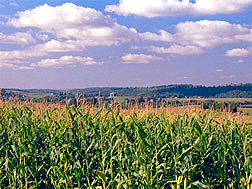 ILUC has been used as an argument for stopping biofuels development. The theory goes that any acre used in the production of feedstocks for biofuels in the U.S. results in a new acre coming into food or feed production somewhere else in the world. That's a Lot of Hamburgers.